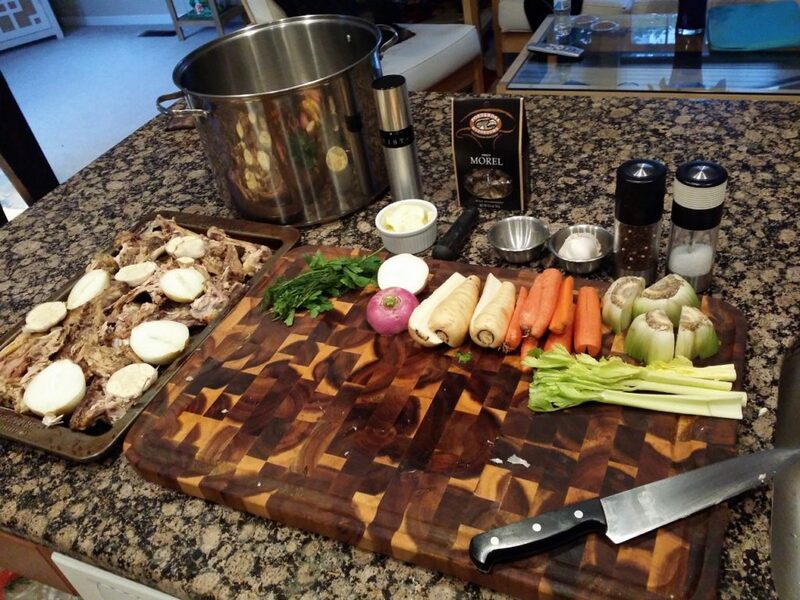 Homemade chicken stock. There is simply no substitute. And haste is discouraged, so set aside a few hours or so. You should pick one of your lazy weekend days so that there is nothing to distract you from enjoying it. 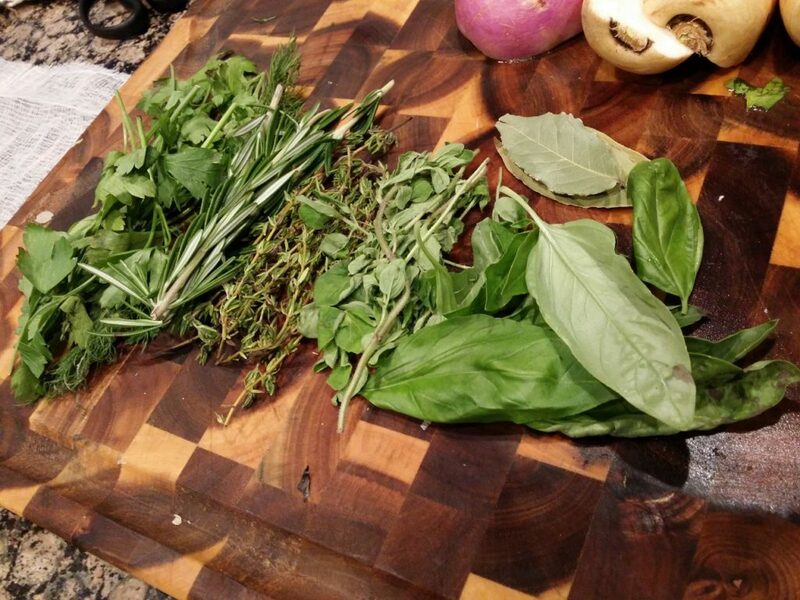 You’ll know what I mean when the aroma fills your house. You don’t even need a specific entree in mind. Actually, most of our stocks come as a by-product of the previous week’s meals. 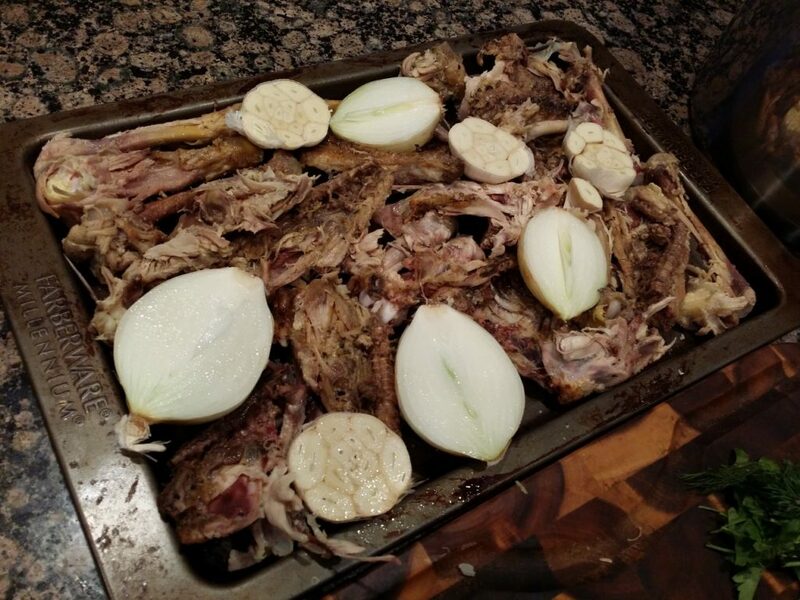 A whole cut up fryer will certainly give that rich, poultry flavor, but any bones you keep (trimmed wing tips, cleaned split breast ribs, etc) can be roasted in the oven prior to adding to the pot with any trimmings or leftover pulled meat . Just remember to crack the bones to expose the marrow. And use something other than your wife’s favorite 12 inch chef knife. Like an actual cleaver. Trust me, I’m saving you some heartache here. There are really only 4 main parts to this. 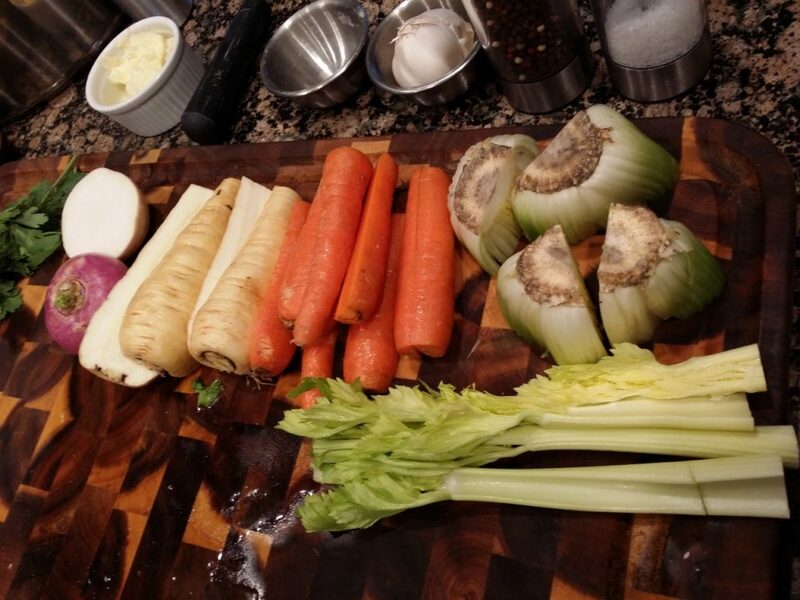 COLD water, the bones / meat, the mirepoix (vegetables), and the herb seasonings. I will, occasionally, mix the water with a carton of low-sodium stock if my bone supply is limited. Shut up, I can do what I want. If you use any whole parts, remember to remove the skins and trim any excess fat. Use whole vegetables, but at least halve them in order to expose more flesh. 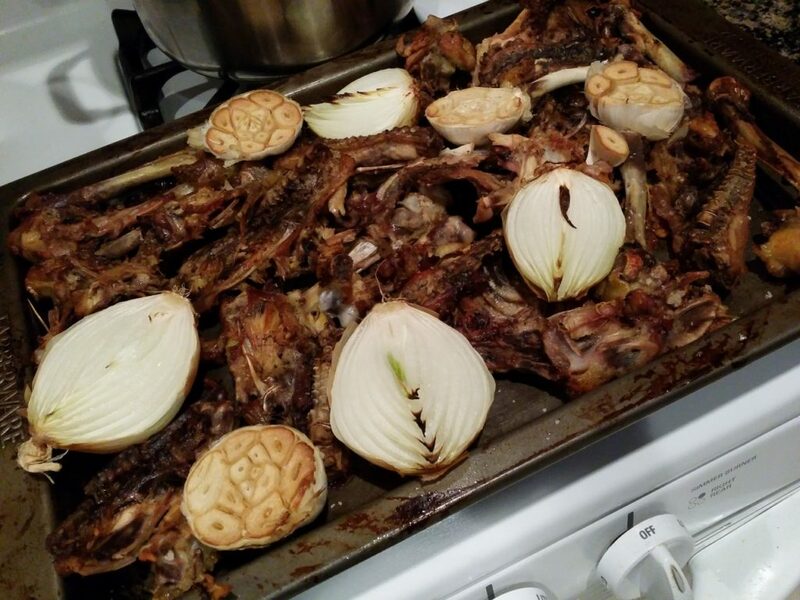 I will usually split the garlic heads and onions and roast them with the bones. 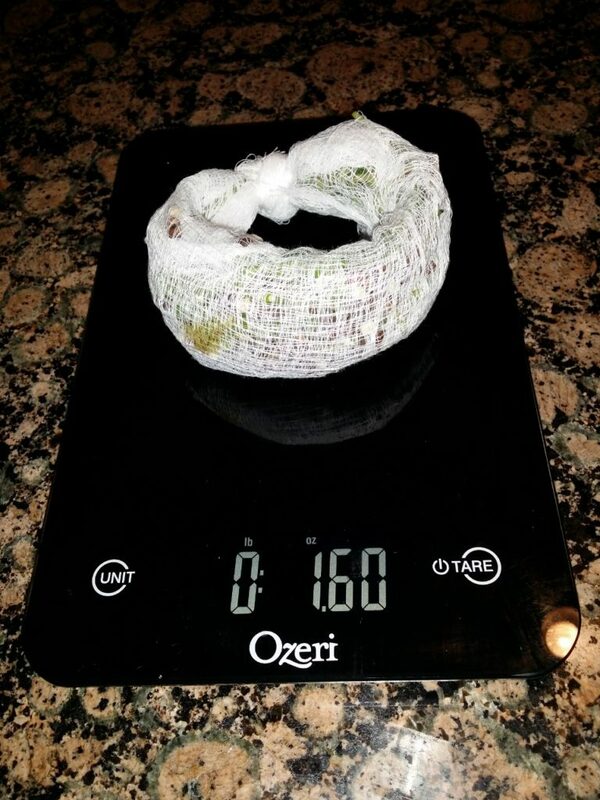 Your seasonings can be bunched up and tied in a square of cheesecloth, making a sachet d’epices. Fancy, huh? Honestly, it makes it much easier to retrieve them. Pro Tip: tie it to the pot handle. Roast the bones / carcass / trimmings on a cookie sheet in the oven at 400 for 30 minutes. Spray with olive or canola oil and sprinkle liberally with kosher salt. You can add the split garlic heads and onions to the sheet for the last 15 minutes. Let cool and crack the bones to expose the marrow. If using a whole chicken or parts, cut into 2 inch cubes or just deeply score the flesh. 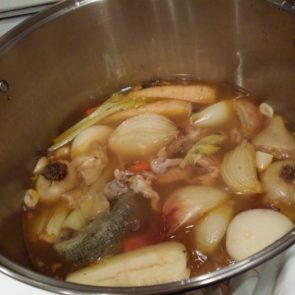 Add the water, chicken, and ham hocks to a large stock pot. Slowly bring to a simmer and let it go for 3 hours. It’s very important not to stir the stock during this time. Too much agitation will cloud the stock. Skim the froth as needed. For the last hour, add the miripoix and sachet. When the stock is ready, strain through a sieve double-lined with cheesecloth and cool in an ice bath, stirring occasionally to cool evenly. When cool, cover and refrigerate overnight. 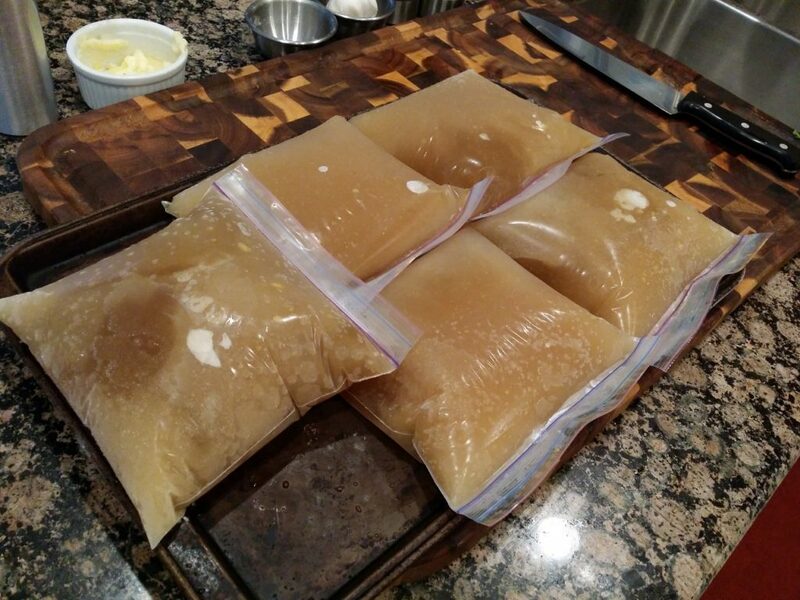 Remove the fat layer and store in freezer bags.